Wolfenstein is one of the oldest video game franchises in existence. In fact, gamers have been playing as William “BJ” Blazkowicz in some form since his debut in the infamous Wolfenstein 3D in 1992. At their E3 2017 “Bethesdaland” celebration, Bethesda revealed Wolfenstein II: The New Colossus. We were able to get our hands on a PC build of the game while at the show, and have impressions ready below. Wolfenstein II uses the id Tech 6 engine. While we’re currently in the dark on hard technical specifics, the game ran at around 60 frames-per-second, possibly higher, on the PC build that we were playing. Lighting was moody, as things would be on a submarine. In such tight quarters, pop-in was non-existent, because there wasn’t much to show off in the distance. You should probably expect a downtrodden color palette, with heavy emphasis on the red and white colors of Nazi symbols, perhaps mixed with the various landscapes of the United States as BJ attempts to lead a revolution against their oppressors. The demo we played picked up where Wolfenstein: The New Order left off. BJ has survived a grenade blast, but just barely. He is now wheelchair-bound and weak overall. Naturally, in this weakened state, the Nazis find and attack him. Your goal becomes surviving the onslaught of enemies, while being severely limited in firepower and health. Since BJ’s health is on the decline, you are limited to only 50 health for the duration of the level. You can acquire health pickups to increase that number, but any time your health is above 50, it begins to count back down to 50 within a relatively short amount of time. You can still collect armor, which thankfully did not appear to have the same limit, though there is not much to go around. If BJ’s health dropped below 10, it would climb back up to 10 if he managed to stay out of harm’s way for what felt like an eternity. Wolfenstein II felt like a challenging game, which is a plus. While the introduction of the game is designed to have the player at a literal handicap, enemies can generally aim fairly well, and soak up a decent amount of damage before being defeated. 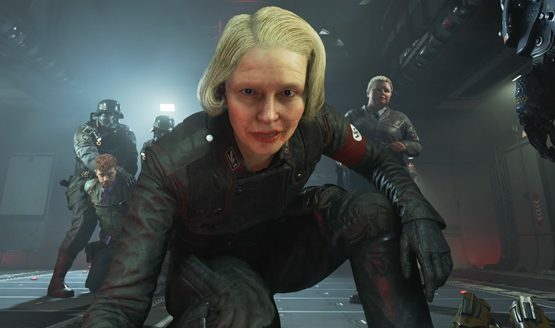 While a representative from MachineGames indicated that they were still tweaking the difficulty, it wouldn’t feel like a Wolfenstein game if it wasn’t a challenge. Since BJ is confined to a wheelchair for most of the level, moving around is slow-going. You also have to think about where you want to go, planning your route around stairs since hopping up them is not an option. There are occasional wheelchair lifts in the submarine, which felt a little too convenient, but then again those lifts could have been used to carry ammunition and other supplies, so perhaps it isn’t so far-fetched. Level designs also included clever ways of getting BJ up to the next level, such as hitching a ride on some of the submarine’s massive gears in order to get to a platform above. Littered throughout the level were microwave tunnels, activated by a nearby switch. Turning the switch on killed anything or anyone unlucky enough to walk through the mostly-invisible field, including BJ himself – I definitely wasn’t paying close enough attention the first few times I encountered these strange microwave corridors, and fried myself a couple of times. Wolfenstein II: The New Colossus is shaping up to be a game that will no doubt please fans of the series, and especially fans of the last game in this venerable franchise. While some of the wheelchair-bound elements to the mission that we played felt a little forced, the point that BJ is vulnerable and weakened is one that was refreshing to see, keeping you on your toes against enemies that might otherwise pose little threat to our traditionally macho hero. Wolfenstein II: The New Colossus is scheduled for release on October 27, 2017 on the PS4, Microsoft Windows, and Xbox One platforms.